If you are searching for a new or used HP Laserjet 9000n printer, then you have come to the right place! At Arizona Copiers, we have the greatest selection of all high-quality Hewlett Packard models and all of their supplies in the state. Whichever design or customization you prefer, we can help provide you with the best solution for your business’ needs and budget. Our experienced professionals are proud of our inventory that offers the most reasonably priced options for purchasing, leasing, or renting printers and copiers. With our superb customer service, repairs service, and speedy delivery, Arizona Copier offers an unparalleled 100 percent customer satisfaction guarantee. Feel free to call us today at 602-428-5885 with any questions and to obtain an exceptional quote. Your business will significantly reduce printing time with this high-speed HP Laserjet 9000n laser multifunction printer. It offers a tremendous printing and copying output speed of up to 50 pages per minute. Take full advantage of this powerful print engine with its robust 300 MHz processor to deliver edge-to-edge fast printing. Efficiently render all of your large business’ workload with the instant printing capabilities and superior 1200×1200 dpi resolution for sharp text and images. Built to handle even the busiest office’s printing needs, the duty cycle produces up to 300,000 pages every month. This Hewlett Packard model offers beneficial advanced paper handling abilities as well, which enable you to print on both sides of sheets automatically. The embedded duplexer provides efficient use of ink and lowers your business’ paper use for significant cost deductions. Without any compromise on quality, the printer can provide optional finishing touches, such as job separation, stacking, stapling, and sorting for optimal completion of business projects with ease. When you purchase the HP Laserjet 9000n from the Arizona Copier company, you will benefit from the HP Jetdirect EIO internal print server that can process up to 2 MB of data every second! This avoids any bottle neck of important information flow through the network and to your printer. With the HP web free downloadable applications and software, your business can easily set up the Hewlett Packard model with simple network configuration, installation, and management without any complex training. Businesses can also utilize the wireless networking options from the internal print server for easy and quick printing throughout your office. 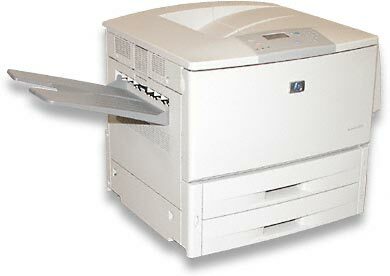 Get Your Own HP Laserjet 9000n Printer Today! At Arizona Copier, we have all of the best Hewlett Packard products offered on the market conveniently in our stock inventory. Our locally owned company is committed to providing our customers with the most high-quality printers available to increase your business’ efficiency and growth. We are dedicated to providing timely and safe delivery of your newest purchase in flawless condition throughout our expansive service area in the Valley of the Sun. We encourage you to call us at 602-428-5885 to get started on purchasing, renting, or leasing your own HP Laserjet 9000n today!